His Majesty King Abdullah II and His Royal Highness Crown Prince Al Hussein received team members of the Hashemite Committee for Disabled Soldiers’ (HCDS) who participated in the 2018 Invictus Games in Sydney, on Thursday, November 8, 2018. During the meeting, His Majesty expressed pride in the team's achievements in the games. The Invictus Games Sydney 2018 is dedicated for wounded serving and former military personnel. 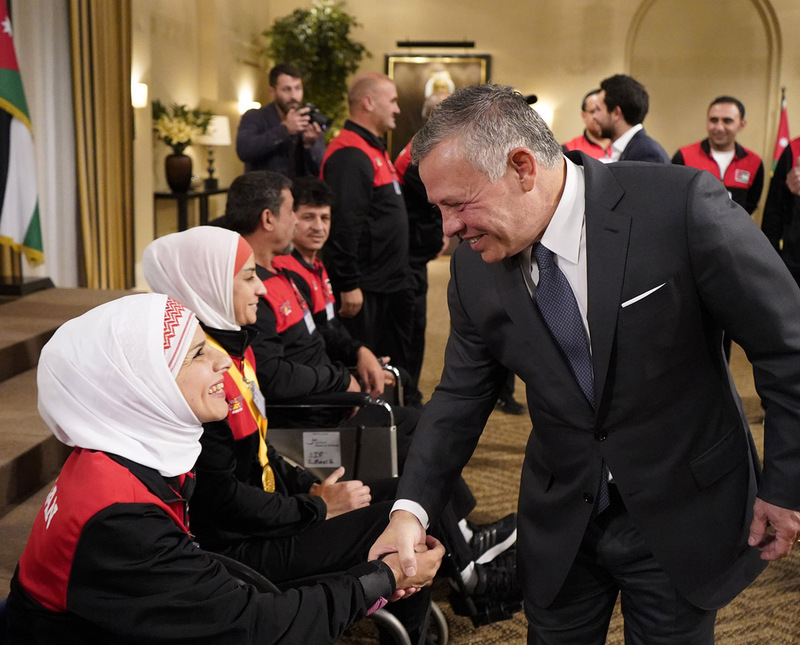 With the participation of more than 500 athletes from 18 countries, the Jordanian team won a total of nine medals (5 gold, 3 silver, and 1 bronze) in various Invictus competitions; which were recently held in the Australian city of Sydney. The meeting was attended by HRH Prince Mar'ed bin Ra'ad, President of the HCDS, Chief of the Royal Court and Adviser to the King, as well as the Director of His Majesty's Office.